In June 1952 the musical , “Wish You Were Here” opened on Broadway. The title song was Eddie’s first No.1. He himself found his next hit, a piece of sheet music lying on a piano during a record session. He asked Hugo Winterhalter if he could record it. 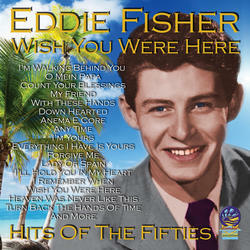 According to Colin Escott’s note for “Eddie Fisher Greatest Hits”, Hugo “wrote a delirious arrangement, catapulting an obscure British song from the Thirties Lady Of Spain back into the charts”. On April 7th 1953 while still in uniform Eddie recorded another British song, a current one, with Sally Sweetland I’m Walking Behind You. It became his second No.1. The U.S. Army discharged Eddie on April 10th 1953 and he opened at the Paramount Theater at 11 o’clock that morning, just as if he had never been away. On April 29th he started his TV series, sponsored by Coca Cola, which was broadcast over 600 stations. Eddie’s third No.1 was Oh! My Pa-Pa which he was able to sing with a straight face. Recorded in November 1953, it was still in the charts till March 1954. I Need You Now was Eddie’s fourth No.1, staying in the 1954 charts for six months and becoming his seventh million-selling record. As well as making records and appearing on radio and TV, Eddie also acted in the movies, “All About Eve”, “Bundle of Joy” with Debbie Reynolds, both 1950 and “Butterfield 8” with Elizabeth Taylor, 1960. In addition to selling millions of records in the U.S., Eddie had two No.1 records in Britain, Outside Of Heaven and I’m Walking Behind You. 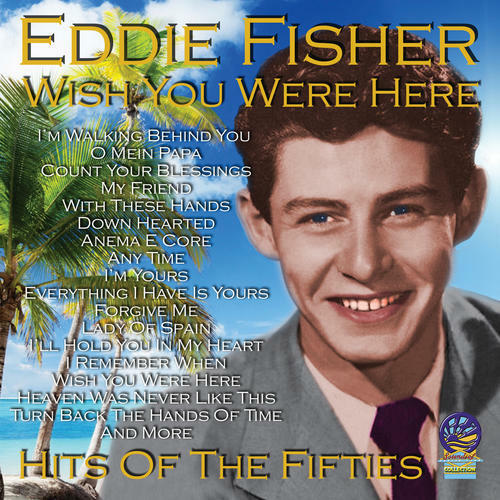 The last track on this CD is Count Your Blessings by Irving Berlin who summed up Eddie Fisher by saying, “He was the closest thing I have heard to Al Jolson”. Eddie died in Berkley, California, on September 22nd 2010.